Earn $3.79 in Rewards credit. Click to learn more. A standard for precision and affordability. 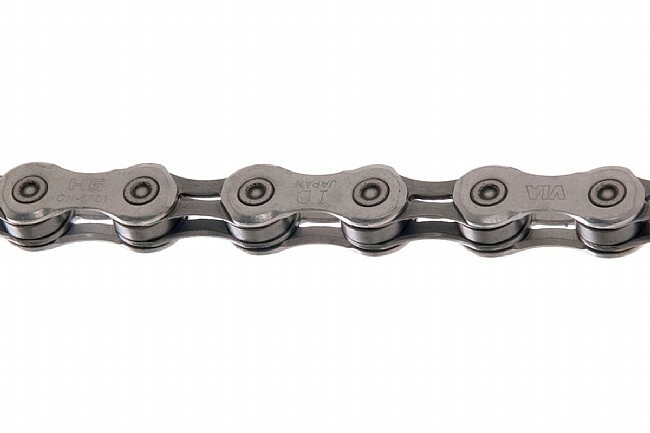 Carrying on the Ultegra tradition of borrowing from the Dura-Ace line, the CN-6701 chain features an asymmetric design for efficient cog and chainring engagement and increased durability. Perforated links shave grams without weakening. This 6701 model is lighter than the previous 6700 design with extended durability. My Cannondale caad10 Ultegra is so sweet to ride especially when I am sporting a new Shimano chain. A new chain can make your bike run like a deer. I love my Cannondale caad10 Ultegra, but even more when my favorite mechanic Todd puts on a new chain and tightens up the derailleur. Ride safe, but wear a bracelet with your medical contact. I recently purchased this chain as a replacement for a KMC chain I had previously. My bike had a mix of Shimano 105, KMC, and FSA components, but I've made a couple upgrades to Ultegra as I wore parts out. I found this chain to be easy to install and it's running smoothly on my bike now. I've noticed that my efficiency has increased slightly since installation, which has translated to several unexpected PRs on Strava segments. I am very happy with the high standard Shimano has set with their components, and Ultegra is a great balance of performance and price. Replaced my original chain after 3600 miles (still had life left) on trek road bike. The shimano is lighter and shifts smoother than the original even when new. I get good miles out of my chains as I clean them every 150-200 miles. I remove soak them in simple green, scrub with paint brush, rinse and blow dry with hair dryer, reinstall with master link then use Motorex road strong motor cycle lube. I know your thinking this guy is text book OCD my wife keeps telling me that, never the less my LBS tells me what ever I'm doing its working. Cleans easy and last long. Good reliable chain that is quiet and shifts well. I train a great deal for all types of road races and go through several chains each year. Caught these on sale and stocked up for the year. The order was shipped quickly and arrived within a few days. I have always had good service from Western Bikeworks. Inexpensive yet smooth functioning chain. use on a road bike. Plenty long to fit big gears. Easy to install, just be sure chain writing is facing out as it is directional which improves shifting. I install a removable master link for easy cleaning. It would be nice if Shimano included one but the pin also works fine. Google the chain for specific installation instructions. In case the chain breaks, a spare master link will get you home. Easy installation, was a direct replacement for an old chain with a stuck link, works great. Once again why oh why pay so much more for a product to just save weight. I have an all Ultegra 10 speed drive train, except for FSA cranks. I ran Ultegra chains for a couple of years, but then came across sale on Dura Ace 10 speed chains and decided to try it. No perceptible difference in performance or longevity, but noticeably quieter that Ultegra. Now I can't seem to find Dura Ace 10 speed chains anywhere. Perhaps Shimano has quit making them. Anyway, the Ultegra chain is a great chain and if you find it on sale get a couple. Great chain for the price! I use the chain on my road bikes & I average 300 miles per, the chains are very durable. Wish it was lighter. cost effective I work them and wear them out at about 1600 miles hard use but they perform well. Remove chain completely,no degreasers throughly clean every 2-3 rides (100-150 mi.) check and wipe down every ride with very light coat lube for cleaning purposes fully lube 1 drop per link when chain talks to me. Quiet and easy to install.